Aortic dissection (AD) is caused by blood flowing into an intimal tear on the innermost layer of the aorta leading to the formation of true lumen and false lumen. For type B aortic Dissection (TBAD), the tear can appear beyond the left subclavian artery or in the aortic arch according to Stanford classification. Quantitative and qualitative analysis of the geometrical and biomedical parameters of TBAD such as maximum transverse diameter of the thoracic aorta, maximum diameter of the true-false lumen and the length of proximal landing zone is crucial for the treatment planning of thoracic endovascular aortic repair (TEVAR), follow-up as well as long-term outcome prediction of TBAD. Its experience-dependent to measure accurately the parameters of TBAD even with the help of computer-aided software. In this paper, we describe our efforts towards the realization of automatic measurement of TBAD parameters with the hope to help surgeons better manage the disease and lighten their burden. In our efforts to achieve this goal, a large standard TBAD database with manual annotation of the entire aorta, true lumen, false lumen and aortic wall is built. A series of deep learning based methods for automatic segmentation of TBAD are developed and evaluated using the database. Finally, automatic measurement techniques are developed based on the output of our automatic segmentation module. 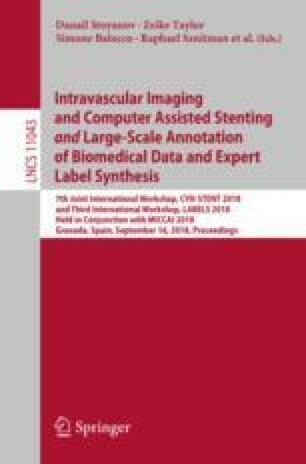 Clinical applications of the automatic measurement methods as well as the perspective of deep learning in dealing with TBAD is also discussed. J. Li and L. Cao—Contributed equally to this work.